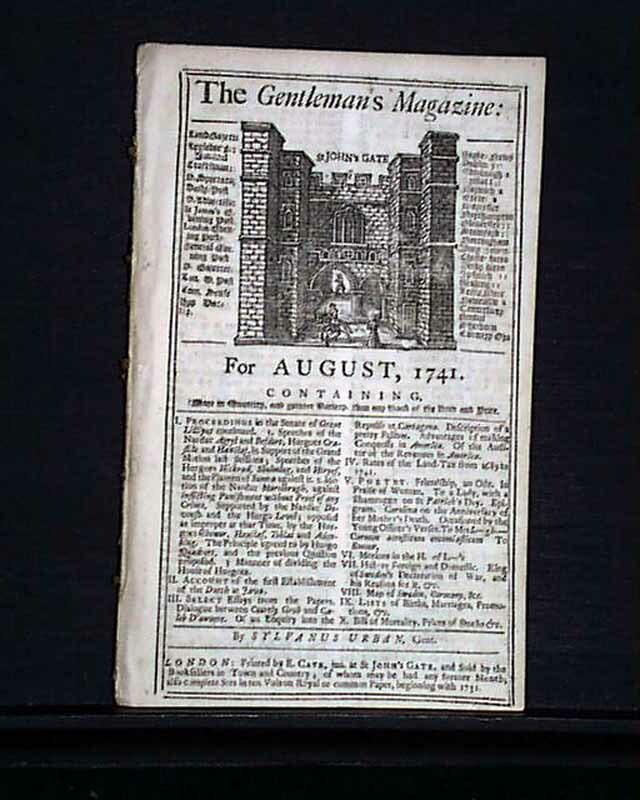 THE GENTLEMAN'S MAGAZINE, London, England, August, 1741 Within this issue is an article: "Of the Office of Auditor of the Revenue in America" which includes: "I am a native of New England & having read in your paper...The state of importance of the American colonies is so little understood or regarded...it would be better for England if all the Plantations were at the bottom of the sea, tho' they have brought in so many millions to England..." with much more, taking over a full pg. of text (see photos for portions). 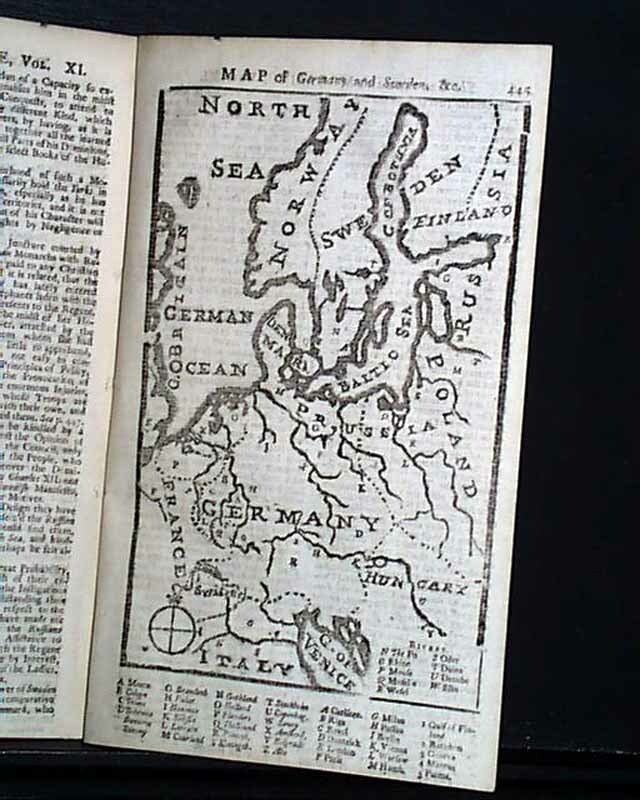 A feature of this issue is the full page map headed: "Map of Germany and Sweden" but it also includes portions of Hungary, Finland, Norway, Denmark, Russia, Prussia, France, and Italy (see photos) with various city locations noted as well. "Extract from the Speech of Hon. George Clark...Commander in Chief of the Colony of New York to the General Assembly of that Colony" which takes most of a pg. 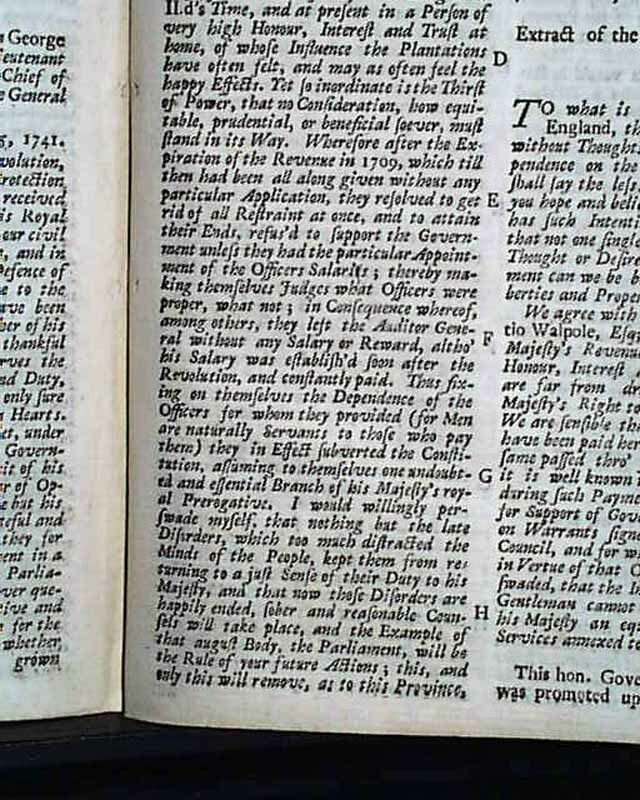 with a portion including: "...as to this province, a jealousy which for some years has obtained in England, that the Plantations are not without thoughts of throwing off their dependence on the Crown of England. I hope & believe no man in this Province has any such intention..." with more (see for portions). 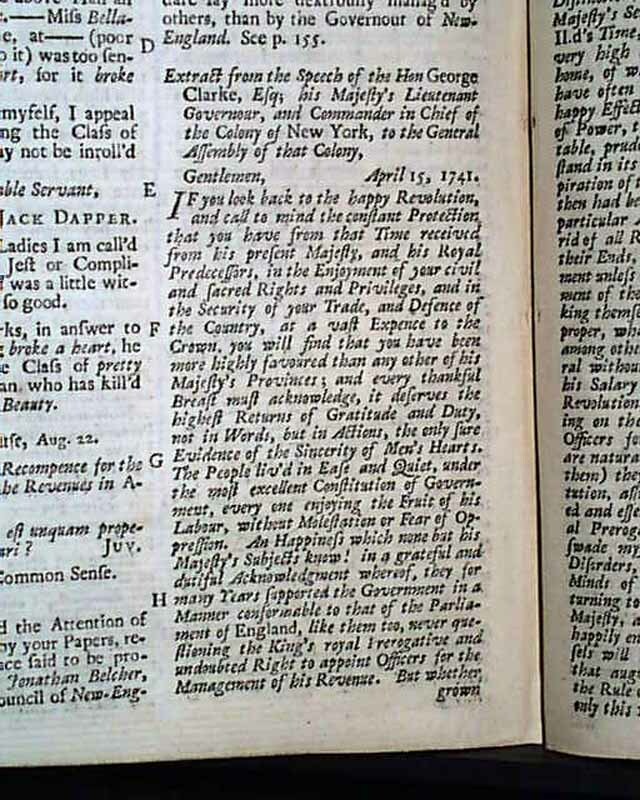 Another report in this issue is headed: "Extract of a Letter from New York" and includes: "...was discovered to have engaged the Negroes in a general conspiracy & provided them with long knives and fire arms. Their design was to fire the town in different parts & then to rise and murder the white people. 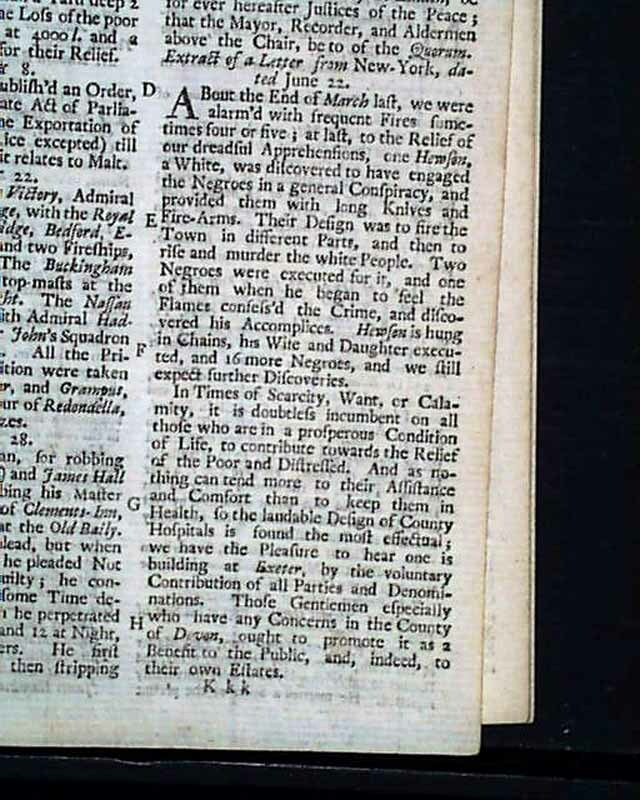 Two negroes were executed for it..." with more on this attempted slave insurrection (see photos). 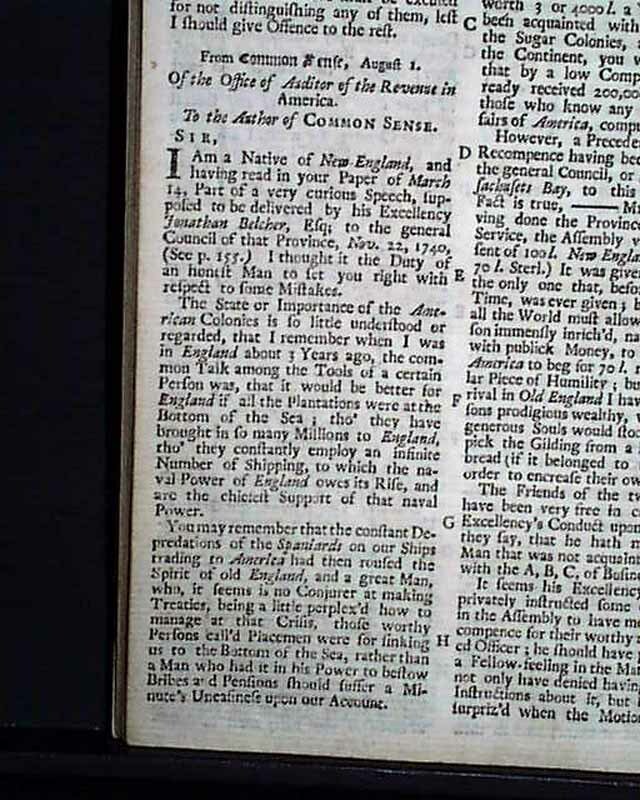 * "Account of the First Establishment of the Dutch at Java"
* "Advantages of Making Conquests in America & that we Ought not to be intimidated by France" takes over a full pg. * "The King of Sweden's Declaration of War against the Czar of Russia"
There is much reporting on events in Parliament under the guise of: "Proceedings & Debates in the Senate of Lilliput" as direct reporting on Parliamentary events was prohibited. Complete in 54 pgs. 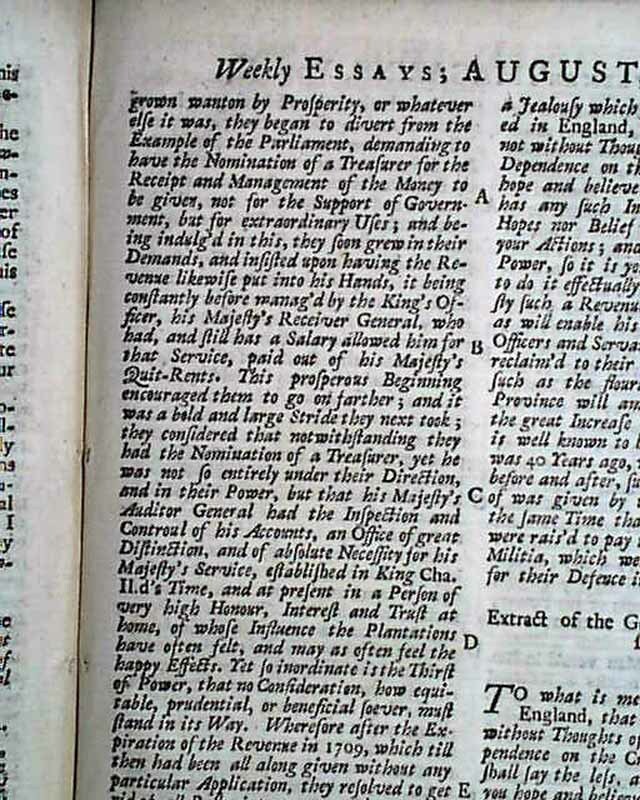 with full title/index page which contains an engraving of St. John's Gate. This is measuring about 5 by 8 inches, very nice condition. No plates called for in this issue.